BrookfieldAngler.com: The 2015 Hobie Pro Angler 14 is home!! The 2015 Hobie Pro Angler 14 is home!! 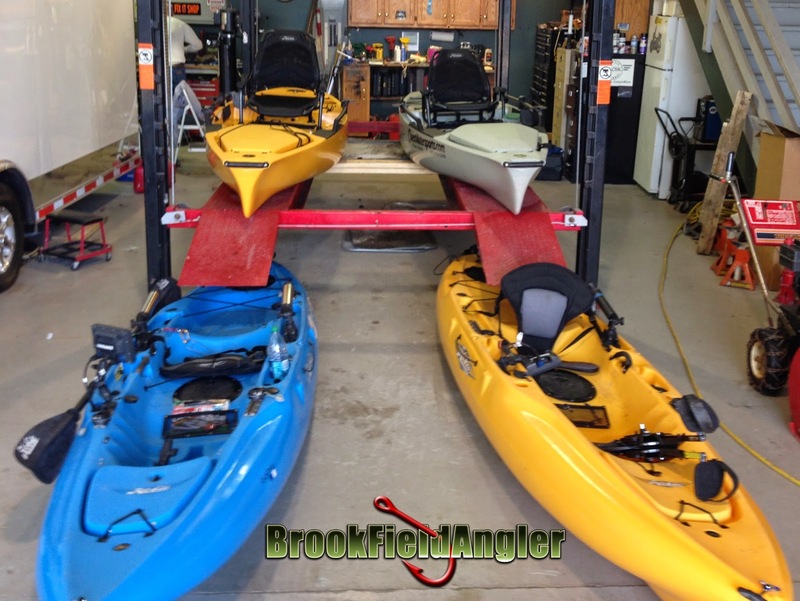 If you are on Facebook and "like" the BrookFieldAngler page, you might have noticed that I picked up the new 2015 Hobie Pro Angler 14 on Wednesday and had a fun day of rigging on Thursday! If you aren't a FB person, here's the story! I had a short day of work on New Years eve and was out of the office by noon so I drove over to Quest Watersports in Ottawa, IL where Jeff had my shiny new kayak waiting for me! As I drooled and played with every little gizmo this thing has, I noticed something missing....I couldn't figure it out at first but then it hit me! I said, "Jeff - you are my sponsoring Hobie dealer and all you have on there is just a tiny little sticker!! Don't you have any bigger vinyl pieces that say Quest Watersports?" We quickly went to work on rectifying that problem and got some vinyl applied! I actually started the graphics department for the company I work for and still occasionally have to lay some vinyl when I'm at a trade show so we made short work of it! I still have some other sponsor tags to get on there but those are the only stickers so far! Once finished with the vinyl, we got to loading it in the truck. Before the PA14, I had always just dropped the tailgate and thrown the outback right in there. This boat is about two feet longer so I bought a bed extender off of Ebay. Once I put that on, the boat went in and fit perfectly. Despite the increased weight, loading and unloading it solo isn't really any harder than the Outback was. It just takes an extra step to put on and remove the bed extender. The next day, I loaded up both kayaks in the truck and headed by the Lucid Fishing garage with Teddy to start rigging. Teddy also had a new 2015 Pro Angler to rig up so we were hard at work taking various mounts and fish finders off the old Outbacks and getting everything set up on the new Pro Anglers. The PA's were really quite easy to set up utilizing Hobie's new H-Rail system. There are quite a few accessories that attach to the rail including flat bases to mount rod holders, cup holders, and even a clamp on ram ball mount. I initially grabbed two of the flat bases and a ram ball mount for my fish finder to get me out for an initial test. After a couple of hours, everything transferred over including two rod holders, my fish finder, and one of my Railblaza Starports that I use for my front camera. What is really nice about the H Rail system is that everything can slide forward or backwards to adjust layout/positioning as often, and whenever, you want. This will make it super easy to adapt to different species and techniques like trolling, fly fishing, casting or jigging for any species you can catch. I will definitely be adding at least two more of the flat bases for a third rod holder and another starport for rear mount camera. I am sure that a third camera will be added in the near future as well. The first outing is scheduled for Saturday as long as this freezing rain thing that the weatherman are predicting isn't that bad. I can deal with rain and snow...freezing rain is just a nightmare. From the time I have spent sitting in the seat and rigging it, this boat is massive and incredibly roomy. The new Vantage seats are the most comfortable and adjustable things I have ever seen on a kayak. There are ton of areas for storing rods, tackle, fish, or anything else you can think of. The deck is huge and flat so standing will be a breeze. The only real challenge that I am facing is storing the kayak itself. My garage is a literal two car garage with almost no additional space. The outback was easy because I could just throw it on my wall rack that consists of a couple of arms I got from Home Depot. I knew the Proangler was quite a bit heavier so I moved my hooks lower on the wall because I knew that I wouldn't be able to lift it five feet off the ground. Still, getting it on the hooks that are only a foot off the ground is extremely challenging. Because the proangler is so wide, it's taller when you flip it on it's side so picking it up is extremely awkward. If I was a foot taller, it might make it a bit easier but I'm not so I have to figure out an easier system. That's all for now. Stay tuned for a ton of great fishing from the Hobie Proangler 14 in 2015!! That's just plain cool, Nick. Nice going. I look forward to your adventures. It's amazing that a kayak can have so much going on. Can't wait to share those adventures! That's a serious fleet you got there...you have the destroyer and the aircraft carrier of the yak world. Congrats!! Sounds like some cool Top Gun stuff!